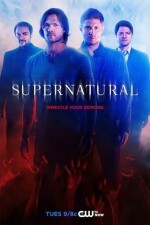 Supernatural gives us a glimpse into the social world of hunters in “Celebrating the Life of Asa Fox.” New series writer Steven Yockey partners with director John Badham to give us a hunter’s wake filled with an interesting cast of characters and the backdrop of classic Canadian rock. With an appearance by fan favorite Jody Mills and a frightening crossroads demon, “Celebrating the Life of Asa Fox” makes for a pretty interesting episode of Supernatural. Besides the Winchesters, we’ve met quite a few other hunters over the last 12 seasons. There are family and friends like Bobby Singer, Ellen and Jo Harvelle, Rufus Turner, and Garth Fitzgerald IV. There are old-school hunters that had known John, like Travis and Martin Creaser. And then there are the hunters who have tried to kill them, such as Gordon Walker, and Roy and Walt. We’ve even been introduced to historical hunters Dorothy Baum, Elliot Ness, and Samuel Colt. Yet somehow, we don’t have a clear picture of this subculture beyond fake IDs, plaid, and a lot of weapons. The Winchesters have been warned about other hunters by their father, but they also saw how Bobby supported the entire community with his multiple phones and knowledge of the supernatural. “Celebrating the Life of Asa Fox” provides a different perspective into the world of hunters. It turns out that Sam and Dean were not the only ones who became hunters because of Mary Winchester. Asa got hooked on this path, much to his own mother’s dismay. Motherhood, loss, and grief are important themes in “Celebrating the Life of Asa Fox.” Seeing a mother’s perspective from characters other than Rowena was refreshing. Having both Jody and Mary in this episode was a touch of brilliance. Asa’s mother Lorraine has just lost her son, after a lifetime of resisting the choice he made to be a hunter. Lorraine’s anger at Mary is palpable since it was Mary’s brief interlude with her son that altered his path. She tells Mary, “Hunting was his whole life. Never got married, never had kids, and now … enjoy the wake.” All Lorraine could do was look on helplessly at the choices Asa made. Her grief is fresh, and regret evident. Lorraine forgives Mary at the end, her acceptance being helped along by the reveal that she has some grandchildren. Jody has learned to live with her grief. Though she feels the loss, she has moved past the anger. Ever the mother, Jody tries to help Dean understand his own reactions. Let’s hope Dean starts to practice some acceptance of his own soon. We’re pretty sick of Dean whining about his mom not fulfilling his happy family fantasies. The crossroads demon narrative feels like a diversion from the main story, but creates some interesting drama with a genuinely scary demon hiding out in different people. Seeing what a natural Jody is as a demon allows us to overlook how unbelievable it would be that she doesn’t have an anti-possession tattoo. Guess she’ll be getting one now. The MotW story kind of peters out, with the crossroad demon getting a group exorcism after exposing Bucky as Asa’s killer. The twins’ vow to tell every hunter they meet the story of what Bucky did, serving to satisfy the family’s desire for vengeance. Perhaps the Winchesters will cross paths with this crossroads demon in the future. He doesn’t seem excited to return to the trainwreck of hell. Let’s hope Sam and Dean cross paths again with the witch-raised hunter twins in the future. They were certainly two of the most interesting characters we met at the wake and they seem like they’d make for good allies. Of course, they could always join a Wayward Daughters spin-off about Jody and her girls. We’d be okay with that too. You can see the pain in her sons’ eyes as Mary considers taking Billie’s merciful offer to return her to Heaven. Mary chooses motherhood, deciding to bear her pain for the benefit of her children. We have a fun moment with Dean offering Mary “All the bacon” as they head out to breakfast, but It’s not clear how long Mary will choose to suffer on Earth for the sake of her sons rather than be happy and peaceful in Heaven. In “Celebrating the Life of Asa Fox” we learn a bit more about hunters and their belief that their lives are destined to be nasty, brutish, and short. Dean has taken up the mantra, but Sam isn’t so sure he wants that end for himself. Sam and Dean can’t really be surprised that other hunters tell stories about them. There’s a series of books about them, and all of Heaven and Hell knows who they are. Even well-connected monsters are aware of the boys. What should surprise them is that other hunters revere them. The boys have done their fair share of bad as well as good. Did Sam and Dean just lead Mr. Ketch and the British Men of Letters into the heart of the Canadian hunting community? Supernatural reunites Mary Winchester with her sons in “Celebrating the Life of Asa Fox.” She may not be returning to the bunker right away, but she tells them she will. Let’s hope their reunion gives Sam and Dean some peace, at least for a while. They could use a little joy in their lives. I really enjoyed watching this episode. Like you said, we never really saw a hu yet gathering before, which was interesting. I LOVED seeing Jody finally getting to meet Mary. And I loved Jody’s talk with Dean. Sam is so sweet, he’s just happy to have a mother around, period. He doesn’t really know what to expect. Meanwhile, Dean expects too much. Good episode all around. So far, great season. This season has been pretty fun so far. This was a particularly strong episode. I wonder if there will be an episode with a unique perspective this season, like “Fan Fiction” in Season 10 and “Baby” in Season 11? Can’t wait to see what surprises they have in store for us. I don’t think that dean is “expecting” too much, I think he is just hoping against all odds. I don’t think he is whining either. he has wanted this since he was 4 years old when his world fell apart and basically, he lost his mom and his dad who really had no time for them due to his obsession with azazel. he raised sam, but no one raised him. jody’s scene with him was heartwarming. and I love that sam is always mentioning dean when he talks to his mom. sam is such a kind soul, when he has it – lol. and I loved that dean’s first thought was for Sammy when he found out that he couldn’t get back into the house. I hope so! Those were some of the best episodes EVER. I remember when they were teasing the fan fic episode before it originally aired. That was the BEST ode to the fans! I wonder if Mary will last the whole season, though. I really hope so, but it seems like they are preparing us for her to go back. We’ll see!